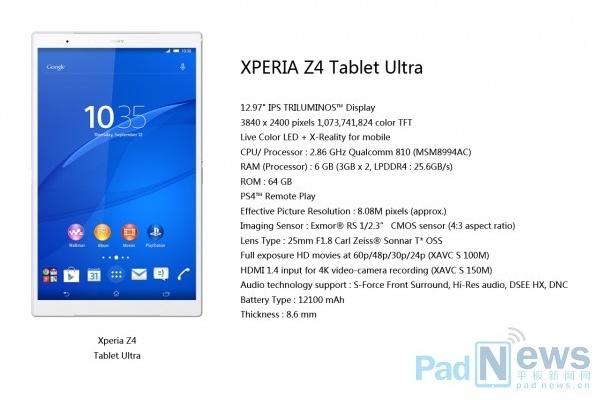 If the leak turns out to be true, this next-gen Xperia Z4 tablet will offer impressive specs, including 6 GB of memory, a 4K display and Qualcomm's Snapdragon 810 SoC. Sony Xperia Z4 Tablet Ultra has not been officially announced yet, but the latest rumors claim it will be unveiled next month, at CES 2015. If the 13-inch screen size does not sound impressive enough, its alleged hardware specs are surely far ahead any possible competitor currently on the market - 3,840X2,400 pixels screen resolution and no less than 6 GB of memory. This large slate will also have a thickness of less than 0.34 inches and will pack PS4 Remote Play and X-Reality for mobile. The rumor does not say if Z4 Tablet Ultra is waterproof or not, but considering the specs above, that would not be a surprise. Remains to see if this device shows up at Sony's CES 2015 press conference on January 5 or not.